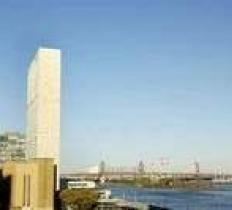 Sunny and peaceful East River view from this stylishly renovated 767 Square Feet convertible one bedroom in one of the city’s most luxurious condo buildings, The Horizon. Renovated chefs-delight kitchen and marble bathroom. The building has a pool, two separate entertainment/exercise floors, outdoor roof deck, children’s playroom, party room and gyms. Truly luxurious home and at a reasonable price. No Pets.